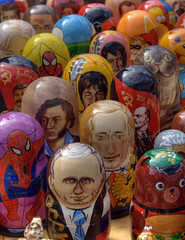 Matryoshka Doll | Hate essays? We’ve talked about answering the question – perhaps narrowing the question, using nuanced arguments, and remembering to use the wording of the question as a motif throughout your essay. Answering the question ensures that your essay is eligible to get marks; the other techniques make hard questions easier, conceive higher quality essays, and speed up the process so you have more free time. It’s important that each paragraph is well structured in its own right, though. This goes beyond knowing when to split or combine thoughts into paragraphs or ordering the paragraphs well. Each paragraph is a mini-argument. So each paragraph has elements which work together to guide your reader through so that they reach your conclusion – or at least appreciate it and give you lots of marks! One important ingredient that strengthens a paragraph is an opening and closing topic sentence. This pair of topic sentences holds the paragraph together; making it easier for the reader to ‘pick up’ and digest its contents (the evidence that supports your argument). Topic sentences do this by introducing the main argument of the paragraph, which improving clarity. Then the closing topic sentence summarises, evaluates, and re-emphasises an important “take-out” point at the end of the paragraph. This makes the paragraph more compelling. Using a pair of topic sentences is sort of like having an introduction and conclusion, on a smaller scale, for each paragraph. Essay writing is often like putting together a babushka doll; each component resembles the one that it’s inside, but it’s smaller and simpler. Repetitive? Perhaps, but that makes it clearer and more compelling. Balance the downside of repetition by using varied expression – but that’s a topic for a future post. Opening topic sentences share a similar function to headings, like the ones in this post. When considering your essay plan, think of the main point of each paragraph as being a heading. Of course, in most academic essays, you won’t use headings (some course lecturers will allow this – check with them before you submit your work). Instead, you can write ‘full sentence’ headings as the first lines of each paragraph – this is a good first attempt at nefarious “topic sentences”, but the two types of topic sentences is a topic (eek) for another time. For an example of topic sentences which shows how well they summarise the main strands of the essay’s argument, see this bird’s-eye-view of an essay. I encourage you to use topic sentences – while they can be a challenge to write initially, with practice writing them will become second nature. Effective topic sentences can lift the rest of a paragraph. Results are far better than expected, based their proportion of words – try it!